Alan James’ artworks derive from a love of the iconography and vernacular of road signs – a desire first sparked by the work of Rosalie Gascoigne. Conceptually the artworks respond to what the artist sees as an increasingly heartless, mindless, humourless world and encourage the viewer to think and reflect on standardised signage in everyday life. Image: Alan James, Stop! 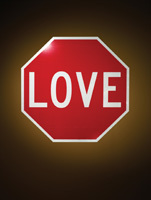 In the Name of Love… (detail) 2003, screen print on retroreflective film on aluminium. Courtesy of the artist.